Instructor’s Bio: Pradipta Biswas is an Assistant Professor at the Centre for Product Design and Manufacturing of Indian Institute of Science. 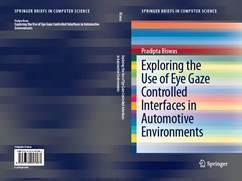 His research focuses on user modelling and multimodal human-machine interaction for aviation and automotive environments and for assistive technology. He set up and leads the Interaction Design Lab at CPDM, IISc. Earlier, he was a Senior Research Associate at Engineering Department, Research Fellow at Wolfson College and Research Associate at Trinity Hall of University of Cambridge. He completed PhD in Computer Science at the Rainbow Group of University of Cambridge Computer Laboratory and Trinity College in 2010 and was awarded a Gates-Cambridge Scholarship in 2006. He undertook a master degree at the Indian Institute of Technology, Kharagpur. He conducted a course on Human Computer Interaction at Indian Institute of Technology, Mandi, guest lecture at Indian Institute of Technology, Madras and was a vice chairman of ITU-T Focus Group on Smart TV.